Andy Summers, the English guitarist and multi-instrumentalist, is an artistic of eclectic talent. Not only was he the guitarist for the rock band The Police, and thus a pioneer of several sonic innovations in rock music, but he also established himself in the world of photography. It’s remarkably inspiring to retrace the history of this outstanding life, listening to Andy Summers unveil his artistic path, where music blends in with photography as his pop career leads to the mentorship of young talents. Chiara Spagnoli: How was it to hold a guitar in your hands for the first time? 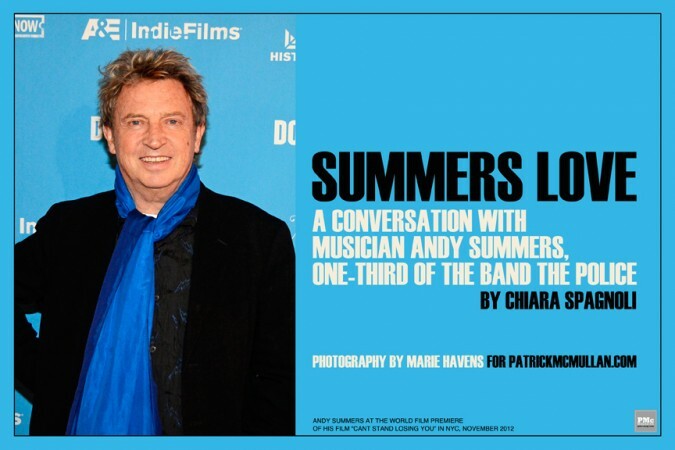 Andy Summers: I was given a guitar by my uncle when I was about 12 and a half years old and it was an instant symbiosis: I would never put it down. I think my fate was sealed by that gift. I used to play the piano before, but the guitar was my thing. CS: You started playing gigs when you were just a teenager, what do you remember of those times? AS: I grew up in a town called Bournemouth, in England, and I was in a band, there were little groups. I played ten hours a day. But it was great for me, I found myself to be very fortunate to have found out at that age that music was the road forward for me. We eventually would go to London with my band and be in shows for weeks. I completely lived a life of music. CS: Was joining The Police that moment that gave a twist to your career? AS: Not in an obvious way, because I joined The Police when it was a sort of fake punk band, on the instinct of something I felt and I also wanted to be in a trio. But there was no future, there was no money, there was no record company. I joined a band that was going nowhere. But then something started to happen: when we came to the US on a tour of the East Coast people got very excited and that was gratifying and authenticating. Those three weeks really put us together as a band. AS: We did this three week tour with literally no money but we had eight songs that we would stretch out in a jam and we would play for an hour and a half: it was very good for us as a band. We went back to England and we were offered to go off on a tour with the comedy rock band called the Albertans. For a 21 day college tour they offered us a pitiful sum to join them as a support act. The first night we went to Bath University and we got on at 7:30pm in a place that was jam-packed with punk kids. We were on stage and the place went in complete pandemonium, there were screaming girls and when we came off the stage the crowd was clear utter riot. The poor Albertans were standing to one side with white faces wondering what had happened. So somehow we started getting known outside of London, and from then on, it got more intense, with sobbing girls and chaos everywhere we played. That is when we knew we had to keep going on. CS: When did you figure the time was ripe to continue playing solo? AS: Well, as I truly am a musician, my musical life depends on more than being in a pop band. I’ve been a serious musician before, I’ve been to the college of American studies of music, I was fully pledged. I absolutely would have carried on as a musician. After The Police, I started making records on my own pretty quickly. CS: Through your music career you experimented with different kind of sound effects, like Echoplex? AS: Yes, it was a sonic landscape sort of thing, particularly in The Police. Echoplex was one of the signature sounds of the band. I started to use this device which gave me repeat rhythms with beautiful spacey echos and from there I started to add more things until I had a sort of sonic pallet. So during the course of a two hour show I could change the sound of the guitar from song to song and do different things with the technology that was available then. I didn’t know then, but I was starting to innovate with some of these sounds. CS: You’re also established in the world of photography, how did that come about? AS: Well, at the beginning I was so absorbed with music that I didn’t take to photography with the same sort of devotion. But it was in the early days in New York, maybe the second time we came here, I had the money by then so I could get a really good camera and I went out with a photographer to the B&H store and bought the icons with upper lenses, and decided to do it seriously. I started to take pictures all the time, carrying my camera everywhere with a bag of film. I became completely obsessed with photography too. I was able to talk to a lot of photographers. Hence, I basically photographed all The Police from day one: I was photo-reporting the band right from the inside. CS: How did the documentary Can’t Stand Losing You, based on your life, come about? AS: The documentary grew organically. I had written my autobiography and I also had done a book of photographs. At the same time I saw a film called The Kid Stays in the Picture by Brett Morgan, who is one of the producers of the documentary, and was going to be the director. I was so impressed with the film of the still photographs, animated with a new technology, and the voiceover, I decided to contact him. And as destiny turned out I met somebody in Los Angeles who knew Brett and put me in touch with him. So I literally contacted him by email and eventually sent him the autobiography and he was blown away by it. So we got together and started working on the film. Then other producers got involved, and the film got financed very quickly, I was pretty amazed. CS: Music, photography, film…any other artistic field you’d like to explore? Architecture, I’m joking. Music has always been my prime interest and of course I love to do photography. Right now I’m excited about a new rock band I put together with a really brilliant singer from L.A. named Rob Giles. The band is called Circa Zero, and we are just about finished with the album. We’re aiming to put that out right after Christmas and start bringing it out into the world. Andy Summers is an English musician and photography, famous for being one-third of the band The Police.